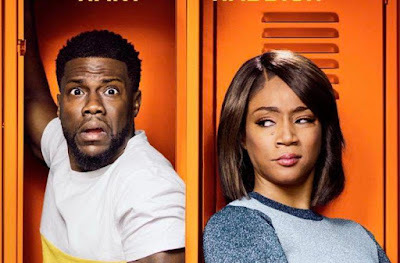 Kevin Hart is a high school dropout in need of a second chance in Night School, the new comedy that marks his latest pairing with uber-producer Will Packer. The duo have teamed up on multiple box office hits starting with Hart's breakout role in Think Like A Man all the way up to Ride Along 2. But this also marks Hart's first film as a producer and co-writer, and his first pairing with Girls Trip superstarTiffany Haddish, making for a pair that should be a potent comic force. But together Hart and Haddish barely get a passing grade in a film that doesn't have enough laughs to justify its nearly two-hour runtime. A reunion between Girls Trip director Malcolm D. Lee and Haddish, the film thrusts her into a headlining role, but unlike that film she is unable to step out of her co-star's shadow. Hart takes center stage as Teddy Walker, a two-bit hustler who puts his talking skills to work as a top BBQ grill salesman. He's got it made; he drives a hot car, and is clearly punching above his weight class by dating high-powered attorney Lisa (Megalyn Echikunwoke), who loves him dearly. Sure, he's spending every last dollar to keep her happy, much to the chagrin of his best friend and unofficial financial advisor (Ben Schwartz), but Teddy's doing pretty good for a guy who dropped out of high school just before taking the SAT. It's not that Teddy is lazy, although he is always looking for short cuts, but that when he sees numbers they tend to jumble like a bowl of alphabet soup. Teddy's flying high, but it all literally goes up in smoke on the night he decides to pop the question to Lisa. Left with no diploma and few job prospects, the only choice Teddy has is to go back to school and get his GED, but he'll have to survive the tough-as-nails night school teacher, Carrie (Haddish), and the school's heelish principal, Stewart (Taran Killam), one of his old childhood rivals. The major draw of Night School is pretty obvious, and that's the pairing of Hart and Haddish as a comic tandem. Hart works best when he's got someone more aggressive than him to play off of, and Haddish makes for a great foil in that respect. Carrie is a teacher who doesn't take any crap from Teddy, Stewart, or any of her students, preaching a tough love approach that may even include beating them up in an MMA cage. Whatever works to get the job done. Meanwhile, Teddy always has some plan to get ahead or a lie to spin, and it gets him in so much trouble he's eventually busted down to selling chicken at a Christian fast food joint, wearing a chicken suit on the corner. If you can imagine Hart's pint-sized self in a chicken suit it's already pretty funny, but I was happy there actually weren't as many jokes about his size this time. How small he is compared to everyone else is self-evident, hilarious, and doesn't need to be pointed out all of the time. It's clear that Hart wants Night School to be more than just his usual brand of dumb humor. The film touches on the idea of giving second chances, helping those with learning disabilities, and fixing a broken public education system. For that it should be commended. However, Hart and five co-writers (!!!) struggle to find ways to implement those themes, and there's a huge chunk of time that just feels like empty space. Rob Riggle, Romany Malco, Mary Lynn Rajskub, Anne Winters, Fat Joe, and Al Madrigal are terrific as Teddy's night school classmates, and I love the way they support one another through their obvious cultural differences, but their scenes together rarely amount to much. An attempted theft of the midterm ends in a lame vomit gag, and a dance-off feels perfunctory. Seriously, must every mainstream "black' comedy have a dance scene in it? However, if one supporting star really stands out it's Malco as Jaylen, a "woke" brotha with an irrational fear of technology who thinks Terminator is a sign of things to come. Any film with Hart and Haddish is going to have its moments, but at 111 minutes this Night School is too much like homework when it should be recess.